"The massive Mercier Bridge looms over the eastern end of the Kahnawake Native reserve carrying commuters into the city of Montreal. For Amy, Lauren and Felicia, three Mohawk teens living in its shadow, the bridge also serves as a constant reminder of the bustling world just beyond the borders of their tiny community. Like typical teenagers, all three are wrestling with critical decisions about their futures. But for these girls, there is more at stake. The rules on the reserve can be strict and unforgiving. Move away and you risk losing your credibility, or worse, your rights as a Mohawk. Stay and you forego untold experiences and opportunities in the 'outside world.' 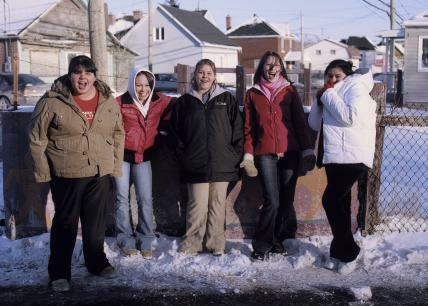 Like nearly half of the teenagers in Kahnawake, filmmaker Tracey Deer utilized government subsidies to attend private school in Montreal. Vowing never to return, she then left the reserve to attend college in the U.S. Now a graduate of Dartmouth University, she has come home to Kahnawake to play a role in the evolution of her community. With insight, humour and compassion, Deer takes us inside the lives of these three teenagers as they tackle the same issues of identity, culture and family she faced a decade earlier. Like her, they are outspoken, honest and wise beyond their years.Shot over two years, and interspersed with home videos from Deer's own adolescence, Mohawk Girls provides a surprising inside look at modern Aboriginal youth culture. Deeply emotional yet unsentimental, it reveals the hope, despair, heartache and promise of growing up Native at the beginning of the 21st century." National Film Board of Canada. "NFB -- Mohawk Girls." National Film Board of Canada. http://onf-nfb.gc.ca/en/our-collection/?idfilm=51283.